Sponsor utilities and others are using the high profile of the Olympics to trial and publicise sustainable technologies. Justin Pugsley reports. The Beijing Olympics in 2008 were about putting on one of the most awesome shows ever seen – appropriate for a country coming of age. Britain, by contrast, has chosen a very different theme for the London 2012 Olympics, one based on sustainability. This dovetails with Britain’s austerity constraints, where getting by with less is the order of the day. For many of the sponsors, the Games are very much about trialling new technologies, and the consequences that will be felt long after the event. This ties in with another important aim of these games: legacy. That applies not just to ensuring that the buildings erected for the event continue to be used for years to come, but also that lessons are learnt about sustainability. “We’re learning a lot about behavioural change from being a sponsor of the Olympics,” says Gareth Wynn, programme director with EDF Energy. “It’s giving us the ability to refine our approach.” EDF Energy is using its sponsorship of the games as an opportunity to highlight ways in which energy users can reduce their consumption and lower their carbon footprints and also promote low-carbon generation. The French utility group founded Team Green Britain, which brings together a million people to share these ideals. Wynn says many lessons will be learned from areas such as large-scale electric vehicle charging, supporting electric vehicle fleets, smart metering and carbon reporting. He adds that this knowledge will be relevant to Britain’s efforts to decarbonise its energy infrastructure. In that spirit, EDF Energy is committed to producing one unit of low-carbon electricity (derived 80 per cent from nuclear and 20 per cent renewables) for every unit consumed at the games. Even non-energy sponsors are taking the sustainability issue seriously. McDonald’s is hosting the largest restaurant in the world at the Olympics, with a seating capacity for 1,500 diners. Apart from being built out of recyclable materials, energy conservation is also a top priority. A spokeswoman for the fast food chain told Utility Week the company is using low-energy hand dryers, LED lighting, reduced energy heating equipment and low energy air source heat pump heating, ventilation and air conditioning. From a utilities point of view, one of the most interesting trials will be that of smart meters supplied by US conglomerate General Electric and installed by EDF Energy in the athletes’ village. The trials will largely focus on the technical aspects of using smart meters, because the electricity consumption patterns of competing Olympic athletes is probably different from typical consumers. EDF Energy and fellow sponsor General Electric are also working closely together on a number of other energy-related projects for the Olympics. The two have collaborated on redoing the lighting on London Bridge. “We’ve replaced the old incandescent light bulbs with low-energy LED lights,” says Tony Gale, director of infrastructure projects with General Electric. “LEDs will provide a 43 per cent energy saving.” He says LEDs will also work out cheaper because they have a 25-year lifespan, which means much lower maintenance costs. The Olympic Delivery Authority (ODA), a public body responsible for developing and building the venues and infrastructure of the Games, sees lowering energy consumption and the carbon footprint of the event as key goals. “We’re targeting a 50 per cent reduction in carbon dioxide emissions and a 40 per cent reduction in the consumption of drinking water [compared with industry norms],” says Holly Hunter, sustainability manager at the ODA. With an eye on legacy, the ODA has set up a website (learninglegacy.london2012.com) where lessons about the Games are being shared. The ODA was hoping to generate around 20 per cent of the Olympics’ energy needs from onsite renewables, but that target was lowered to 11 per cent because of the focus on wind. After dropping the idea of full-sized wind turbines as impractical, the ODA opted for solar panels and a collection of small “halo” vertical axis wind turbines made by Quiet Revolution. “These help power lighting systems and if the electricity they’re generating is not needed it will go back into the grid,” says Hunter. Other measures to reduce power demand includes relying more on natural light at the velodrome during the day. However, spotlights will be required so broadcasters can film the event. As part of its work with the ODA, Thames Water has set up a recycling plant called Old Ford that turns wastewater into usable, non-drinkable water at the rate of 570,000 litres a day for irrigating the lawns and gardens at the Olympic park. It has installed two pumps nicknamed Pinky and Perky for a station capable of taking sewage away at 1,000 litres a second. On the electricity side, GE is providing three gas-fired power generators with diesel back-up to provide 10MW of permanent supply to the park (see feature, page 24). These will be operated by GDF Suez on a 40-year concession. The plants will later be powered by biomass. EDF Energy and GE, along with BMW, have installed 120 electric vehicle chargers to support the Olympic and Paralympic electric vehicle fleet. Once the games are over, these charging points will become part of the Source London network, bringing the total number of chargers to 1,300 by 2013. The time for recharging will be halved when compared with standard rechargers. 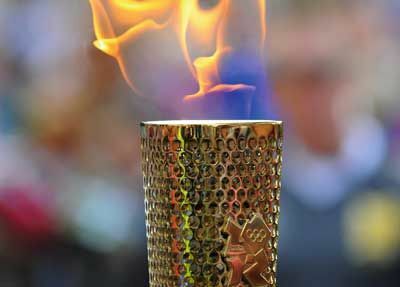 It is possible that many of the trials and innovations that stem from the Olympics will play an important part in decarbonising the UK’s energy infrastructure, which in itself will be a very valuable legacy. This article first appeared in Utility Week’s print edition of 29 June 2012.